I purchased this sweet plate rack at a yard sale about a year ago. Poor thing has been sitting in my workroom waiting for me to give it some love. When I shop at yard sales I intentionally look for items that are broken but have good bones. 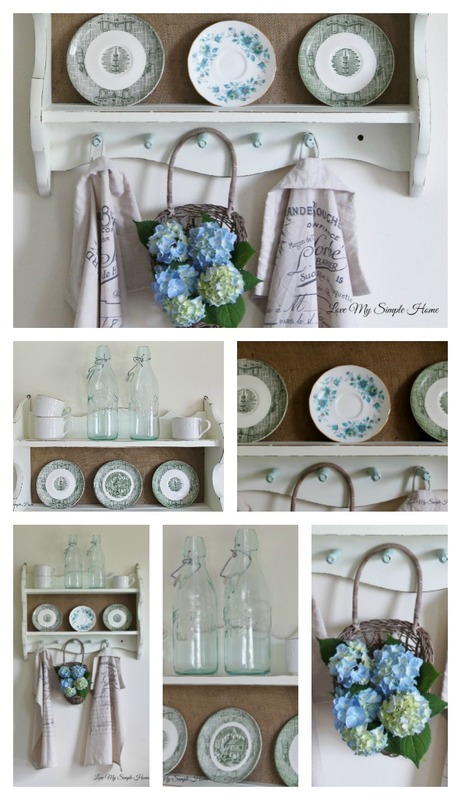 This solid wood plate rack is a good example of what I search for. As you can see it is missing a dowel. A missing part doesn't bother me. I can replace it or leave it as is like I did here. Did you know that paint is my best friend? Well metaphorically speaking. For this project, I applied three coats of latex paint called Cream Silk by Benjamin Moore. For the dowels I used one coat of Refreshing; it is a chalky finish made by Americana Decor. I am in love with this color!! After the paint dried, I distressed the wood, then added burlap to the back. I clipped a few hydrangeas, placed them in a basket and hung them next to two French tea towels. I purchased the tea towels from my favorite online shop Decor Steals. Two milk bottles (a yard sale purchase) are displayed on the top shelf above thrift store plates. What a transformation - it looks gorgeous now! The burlap backing is awesome. I love the subtle touch it gives! Nice makeover! Adding the burlap and painting this piece gives it a fresh new look. Your styling looks so nice! I have a shelf sort of like that one, I would never have thought of adding burlap to the back but I am going to try it.Love the way it looks. I love this project!! The burlap backing changes the whole look. It's beautiful. I love this transformation! What a great idea to add burlap to the back. It definitely has so much more character now! Julie I love your shelf makeover! It's gorgeous! This is gorgeous, and I love this natural look. So simple but elegant. White is always the best choice for a bright look, right? Thanks for sharing! Wow! It looks amazing! It really works with adding the burlap to the back. I want to have one like that. Turned out so nice...what a transformation!